ANGLO- AMERICAN PUBLISHING Co. Location: 172 John Street, Toronto, Ontario. Owner: Sinnott News Ltd.
Contibutor: Ted McCall, J. R. McLeod, Doris Slater. Character: Clip Thomson & Tub, Commander Steele, The Crusaders, Doctor Destine, Don Shield and His Revrso-Ray Freelance, Martin Blake The Animal King, Men of the Mounted, Michael Lee British Secret Service, Purple Rider, Robin Hood, Pat The Air Cadet, Red Rover, Sooper Dooper, Terry Kane. Circus Capers was a feature in Three Aces Comics. Anglo-American Publishing Co. was created because of the cancellation of a cartoon adventure strip. The war put an end to Robin Hood and Company the strip, but it was about to give rise to Robin Hood and Company, the comic book. The resourceful McCall jumped at the opportunity the War Exchange Act provided. He owned the copyright and the printing plates for the Robin Hood and Company strips. Why not he wondered, cut and rearrange the plates into a comic book format? He took the idea to Harold Sinnott of Sinnott News, a magazine distribution company in Southern Ontario. Sinnott liked the proposal and Anglo-American Publishing Co. Ltd. Was born, not to repackage U.S. superheroes but to republish Ted McCall’s comic strip Robin Hood and Company. The first issue appeared in March 1941. Its format was initially tabloid but this was soon dropped in favour of a standard comic book size. The reprints lasted about a year, after which McCall picked up from where the strip had left off and began writing new material with Anglo-American staff doing the illustrations. 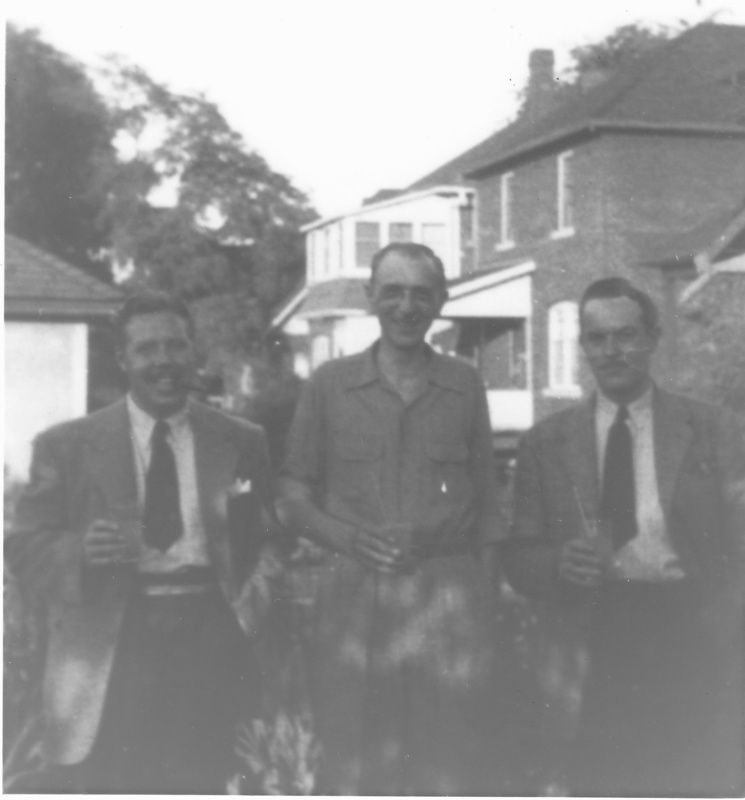 Left to right, Les Gilpin, Ed Furness, circa 1943-44. In July 1941, four months after the appearance of Robin Hood, Anglo-American’s second comic book, Freelance, appeared on the newsstands. It was a 64 page magazine devoted entirely to the adventures of McCall’s hero. So far, Anglo-American had been depending entirely on McCall’s fertile imagination. This situation changed with the publication of two anthology comics, Three Aces in November 1941 and Grand Slam in December. Furness and Les Gilpin, a second Anglo-American artist, were now called on to create characters but they were too inexperienced to fill both comic books. As a result Anglo-American began buying freelance work from Toronto writers and illustrators like the Doris Slater, commissioning scripts from U.S. writers like Otto Binder and Rod Reeder and licensing characters from Fawcett Publications. Whiz Comics which appeared in January 1942, relied entirely imported characters. In the same month Captain Marvel was introduced undoubtedly to take advantage of the Republic Pictures serial that was then playing in Canada. Freelance, Three Aces, Grand Slam, Whiz, Captain Marvel and Spy Smasher; in only ten months Anglo-American had expanded from one to seven comic books. “Freelance remained the star of Anglo-American with sales of about 45,000 copies per issue. “Captain Marvel” did not sell well. Anglo-American’s rapid expansion created artistic problems as well. Its recruits came from art schools and varying backgrounds in commercial art, but had no cartooning experience. The result was a sharp deterioration in the quality of the art work. The situation was so bad for Furness it became a kind of nightmare: “Production is a hungry master. It just devours you.” The low point came it in 1942, when to keep up with production and maintain consistency in the facial features of the principal characters, Furness was forced to use stick-on heads. He drew the heads of the major characters in various sizes and positions and had them printed on sticky paper. The neophyte illustrators had to draw only the body of the character and then attach the appropriate head. Mercifully, the procedure lasted only a few months. As Anglo-American hired more illustrators and they gained more experience, the need for such short-cuts disappeared. At the start, Anglo-American paid $5 per page, split among the various artists doing the page. This rate was later increased to $10 a page. Furness was paid a commission, and the royalty for writing was 1/10 of a cent per copy sold. The staff, with it seems the lone exception of McCall, all worked in an office. In 1943, the studio at Anglo-American began to hit its stride but it was quite different from that of other comic book companies, at least in Canada. Under the pressure of production demands, Ed Furness developed a system based on his animation experience. In it Furness laid out the pages. As the technique of the illustrators improved, these layouts became more sketchy. They were then given to Betty Mercer who did the lettering for Anglo-American’s entire output. The next person to receive the layouts pencilled and inked the principal characters. They then moved to another illustrator who did secondary characters and finally to Malcolm Fleming who did all the backgrounds. As time passed, the approach embraced more and more of the company’s production until finally all of the material, including Freelance, was done by this method. The system was poor from the viewpoint of artistic integrity, but good for overall quality control. Artistically, it inhibited individual development and virtually obliterated any visual distinctiveness of style between stories. However, it did enable illustrators to quickly turn out product of high technical quality. By comparing the drawing quality in “The Crusaders”, an Anglo-American adventure with that of in “Flash Gordon” and “Buck Roger”’ we can see the standard that the system achieved. The draughtsmanship in “The Crusaders” falls far short of the genius of Alex Raymond but is better than that in “Buck Rogers”. In short, the system come not achieve the heights that brilliant individual cartoonists could but it produced work that ranked high among comic books in general. It succeeded for two reasons. Illustrators were assigned the tasks they did best. Betty Mercer and Malcolm Fleming were responsible for lettering and backgrounds because they were most accomplished at these tasks. Likewise, Pricilla Hutchings concentrated on drawing women because this was her strength. As well the experienced staff were assigned the major tasks such as principal characters while the new members were assigned minor tasks less likely to affect the overall quality of the panels. Furthermore, the system made it easier for neophytes to enter the business and develop their skills. June Banfield and Priscilla Hutchings began as inexperienced artists and advanced to the point where they took over most of the finished art on Freelance. With its draughting problems behind it. Anglo-American turned its attention to creating more of its own material. Not only were Furness, Gilpin and Calder more experienced in developing new ideas but Anglo-American had found that its own creations were selling better than its licensed material. Freelance was the company’s best selling comic while sales of Captain Marvel were mediocre. Actually the staff at Anglo-American never stopped introducing new heroes. Les Gilpin had contributed the comical “Super Dooper” who was inspired by Actor Harry Langdon and “The Crusaders” which experienced a remarkable transformation. Starting them as typical heroes, Gilpin apparently wanting relief from a steady diet of war stories, moved them to a remote star system, and the realms of science fiction. But, it was from mid-1944, that Anglo-American quickened the introduction of new characters, Gilpin added “Commander Steel” who at first glance looks like a “Captain Marvel” spinoff but who on closer reading is clearly a descendent from “Freelance”. 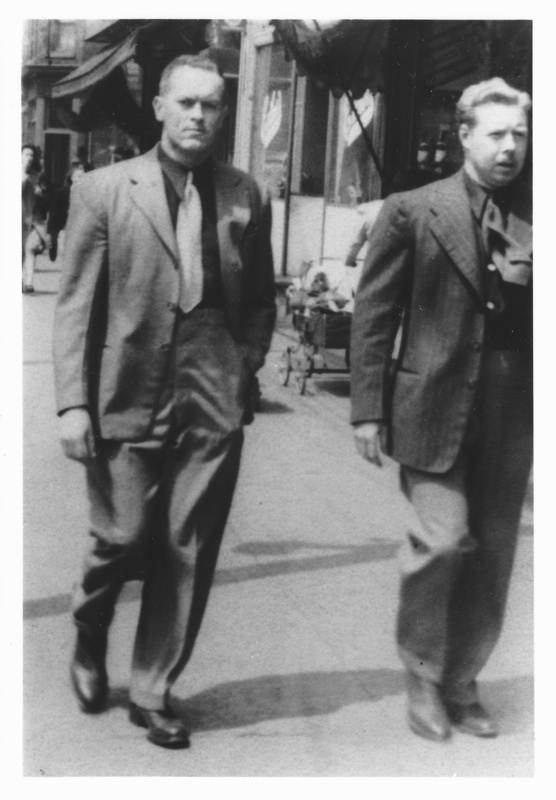 Ed Furness brought to life “Red Rover”, a South seas adventurer who also owed much to “Freelance” and “Doctor Destine”, a detective character modelled on William Powell’s characterization of the “Thin Man”. Ted McCall , that master of recycled creations resurrected “Men of the Mounted” but soon changed the name to “Kip Keene of the Mounted”. Calder contributed “Purple Rider”. The name had nothing to do with “Red Ryder” about whom Calder had never heard but was inspired by Zane Grey’s Riders of the Purple Sage. “Terry Kane” another Calder invention came from an earlier but defunct Anglo-American hero but was modelled on the actor Stewart Granger. The most important source of Anglo-American creativity was Ted McCall, not only because of his prolific output but because of the influence he exerted on other members of Anglo-American’s creative team. McCall own sources appear to have been his newspaper work and his research into Robin Hood and his time. Movies were obviously a close second. U.S. comic books, strangely enough, seemed to have very little influence if any. By the end of 1944, all non-Anglo-American material had been replaced in Three Aces and Grand Slam and they had joined Freelance and Robin Hood as complete Anglo-American productions. In the public relations field, the company supported the Boy Scouts and Cubs of Canada, putting in full page accounts of what Cubs and Boy Scouts were about. Scouts who won medals were honoured and wood-lore tips were included. Early in 1945, a fortuitous event occurred that launched Anglo-American into colour. As Furness recalled, “The Globe and Mail which printed our comics, had bought a four-colour fountain for their daily press and Jimmy Harrison, who’s the superintendent, said to Harold Sinnott, “How’d you like to do your comics in colour?” Well, of course, that was just fine.” Just fine indeed, with the War Exchage Conservation Act still in place, Anglo-American’s conversion to colour would make it a fox in the chicken coop that was the Canadian comics industry. Anglo-American’s first colour comics reached the newsstands in July 1945. By the following month, its entire line was in colour. Unfortunately for Anglo-American, the Canadian government rescinded that part of the War Exchange Conservation Act which banned comics that same summer. The introduction of colour had a profound effect on the company’s comic book production. Whiz, Captain Marvel and Spy Smasher were phased out. Robin Hood and Freelance were combined into one comic, Freelanc/Robin Hood. Grand Slam and Three Aces were compressed into Grand Slam/Three Aces. Anglo-American was back to producing only two comics. This situation lasted about five months until the beginning of 1946 when the combined titles were broken apart to once again form Robin Hood, Freelance, Grand Slam and Three Aces. This reduced line featured only staff-originated characters. For McCall, it was the high point of his comics career. Two of the company’s four comic books not only headlined his heroes, but were exclusively devoted to his stories. The demise of Anglo-American in late 1946 came as a shock to those who worked at the company. “See we thought this thing was going to go on forever.” Furness explained. Certainly the indications were that it would. Anglo-American had successfully transferred to colour and was expanding again. 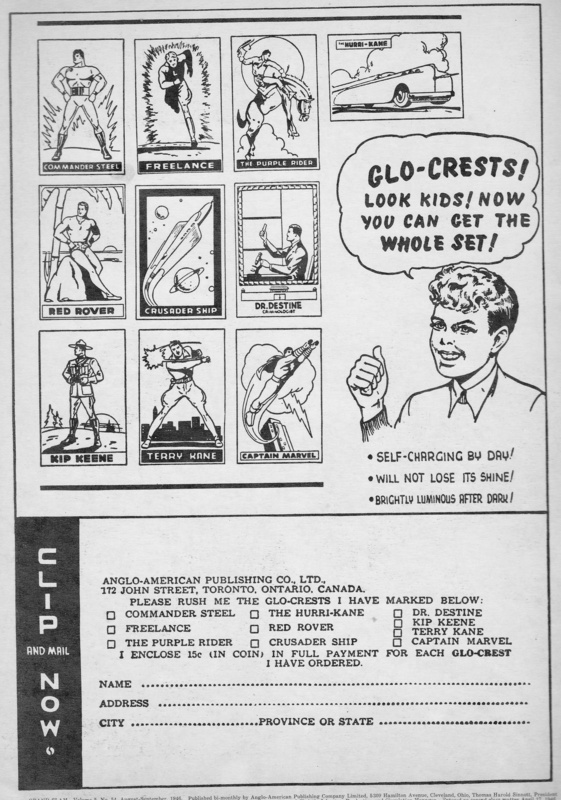 By then, U.S. comics were moving into Canada but Sinnott was attempting to penetrate the U.S. market. He had obtained U.S. copyrights for Anglo-American’s characters and they had applied for 2nd class entry into the U.S. at the Buffalo New York Post Office.. Negotiations were going on with Fawcett Publications for them to distribute such titles as Freelance in the U.S. “They were impressed by the success, in a relatively short time that Freelance had enjoyed …and thought it might take-off down there. The idea, I remember now, was they were going to turn Freelance into some sort of private eye. They did not have a private-eye among their comics, at least not one that was significantly popular.” For some reason negotiations fell through and Furness was told by Sinnott that the operation was at an end. As a postscript to this story, in 2016 I (Robert MacMillan) came across a 1948 pocketbook god’s little acre by the U.S. author, Erskine Caldwell. It was a reprint and it was published by Anglo-American Publishing Co. Toronto. Was Anglo-American trying to reinvent itself as a reprint pocketbook publisher before it ceased operations altogether? Betty Mercer remembered about ten employees in the office. I (Robert MacMillan) suspect this number probably excluded Calder, Furness and Gilpin. Red Rover, Very little is known about this apparently single issue, unnumbered publication. God’s little acre, Writ., E. Caldwell. Anglo-American Publishing Co. Ltd. 1948. Reprinted in Canada. Freelance, black and white interiors. Freelance, 3-2, May/June 1945, black and white interior. Reverts to all “Freelance” stories. 3-30, Jan./Feb. 1946. Freelance and Robin split to separate titles again. 3-32, June/July 1946. 3-33, August/September 1946. Grand Slam Comics, black and white interiors. Grand Slam/3 Aces Comics, colour interiors. IV-45, August 1945. IV-47, October 1945. IV-48, November 1945. IV-49, December 1945. IV-50, January 1946 Grand Slam and 3 Aces split to separate titles again. Robin Hood, black and white interiors. 1-10, August/Sept. 2-3 July/August 2-10, Sept./Oct. Spy Smasher Comics, black and white interiors. 3 Aces Comics, black and white interiors. 3 Aces Comics, colour interiors. Whiz Comics, black and white interiors. Whiz / Spy Smasher Comics, black and white interiors. Portrait of Freelance for 10 cents. car), Dr. Destine, Capt. Marvel, Red Rover, Kip Keene. See advertisement in GALLERY. Crusaders, Freelance & Big John, Terry Kane, Robin Hood & Co., Kip Keene, and others. “The War Years: Anglo-American Publishing Ltd.” Writ., Robert MacMillan. Canuck Comics. Ed., John Bell. Montréal: Matrix Books, 1986. See inside front cover: Three Aces, V-51, Feb. 1946. .“Whatever Happened to …?” Writ., Peter Harris. Globe and Mail, 23 October 1982: Fanfare 7. Multiple interviews with Ed Furness. Advertisement. Three Aces Comics, 4-5, June 1945: Back cover.